Expected ship date 04/21/2019 Estimated lead times do not include weekends or holidays. Transit time is determined by shipping method and destination. Orders requiring credit information might take additional time. Heavy-Duty Flat Panel Emitter Electric Overhead Infrared Heaters provide safe, efficient electric infrared heat for total area heating or spot heating applications for warehouses, steel mills, machine shops and many other industrial applications. 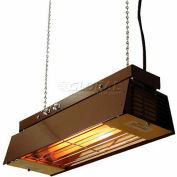 Infrared heaters deliver radiant heat using 60 degree symmetric heat pattern that utilizes bright aluminum reflectors. Electrical infrared heaters feature an aluminum extrusion and support clip for high vibration areas and rugged environments. Rugged straight metal sheath elements installed, great for high vibration areas. 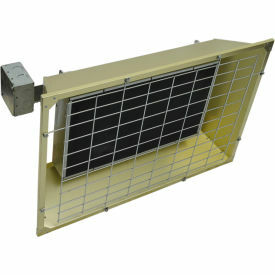 Gold anodized aluminum housing provides long-term reflectivity and corrosion resistance. 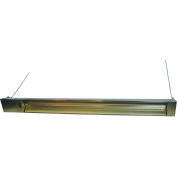 Ceiling heaters include L brackets for chain suspension or rigid mounting. Designed for direct wire, single or three phase wiring configurations, can be wired on either side. 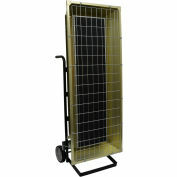 ETL listed for suspended high-bay indoor applications. 1 Year Limited Warranty.